What are those strange birds? Guinea Fowl! You may have seen these strange birds around farms wandering about outside of any fencing and wondered what they were. These birds have been used for years by farmers for a number of purposes. They voracious insect predators. They are valued for controlling ticks, lice and other parasites that may infect both humans and their livestock. Organic farmers look on them as a great means to control garden pests that not only include insects that damage crops, but also slugs and other organism. They are seen as an alternative to expensive and potentially damaging pesticides. These birds are noisy when there are strange animals and strange people near their homes. This makes them valuable as intruder alarms. Guineas are also valuable as a food source. They are an excellent source of “dark” meat. They also can be prolific egg producers which are also edible. A desirable feature of these birds is that when they are raised in a coop on a property and regularly fed by their owners they will return on a daily basis but allowed to free range about the owners property. If you are looking to supplement your chicken coup, Guineas are a great addition. This entry was posted in Farming, Outdoorsman, Uncategorized, Wildlife. Bookmark the permalink. 3 Responses to What are those strange birds? 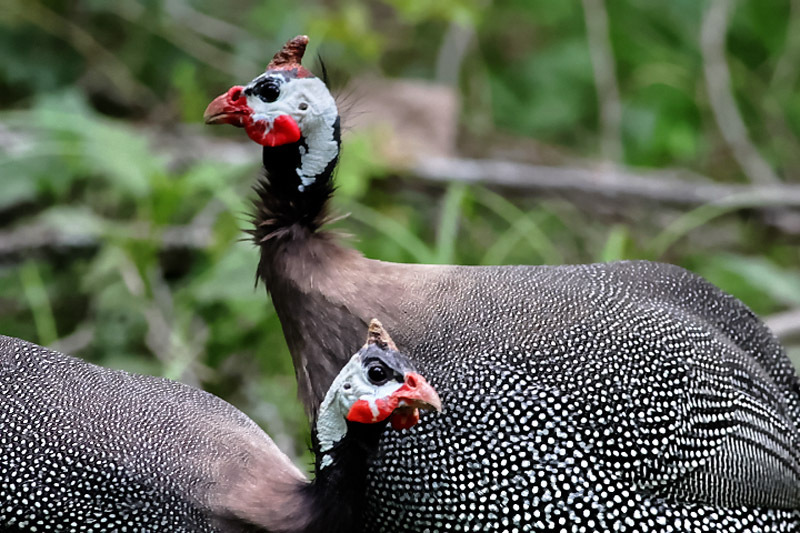 Guinea Fowl!